FROM a distance, the driveway of Julie and Scott Brusaw in rural Sandpoint, Idaho, does not seem like anything special: it is a collection of greenish hexagonal tiles. But a closer look reveals that these are sheets of hardened glass with solar cells underneath. 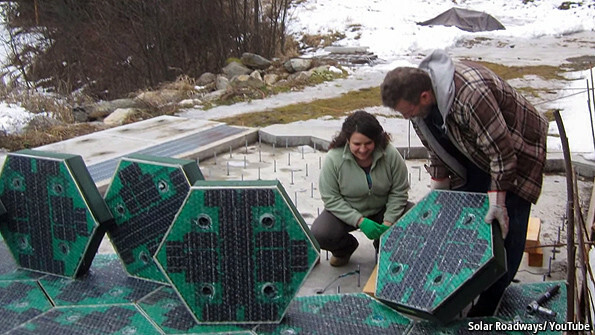 The driveway is a prototype of the solar paving system the Brusaws hope will someday be widely deployed in America and other parts of the word . Using the tiles instead of asphalt and concrete, they claim, could make many carbon-fuelled sources of electricity obsolete. The idea seems to be clicking with a lot of small investors: the Brusaws will soon have raised $2m on Indiegogo, a crowdsourcing site—a record for such projects and twice their initial fund-raising goal. And one of the videos on the Brusaws’ Indiegogo page has gone viral, with nearly 15m views. “When the phrase ‘global warming’ began gaining popularity, we started batting around the idea of replacing asphalt and concrete surfaces with solar panels that could be driven upon,” the Brusaws note on their website. After years of tinkering, Scott Brusaw, an electrical engineer, came up with the idea of encasing solar cells in tempered glass. It is strong enough, he claims, to support a truck weighing more than 100 metric tons—about three to four times as heavy as most of the 18-wheelers that ply American highways. The material is also more chip-resistant than conventional pavements, he says, and can be finished in a texture that has more grip on tires than either concrete or asphalt. America is covered by 75,000 square kilometres of roads: paving only part of them with solar tiles could generate a lot of electricity. But the Brusaws want their tiles to do much more: they could include heating strips to melt snow and ice, LEDs to replace lane markers as well as road signs and communication systems to make roads smarter. Some tiles could even be used wirelessly to charge electric cars parked above them—just like many portable toothbrushes, shavers and (soon) mobile phones are charged today. Despite all these advantages, Solar Roadways, as the Brusaws’ company is called, won’t stretch to the horizon anytime soon. One issue is cost. The firm calculates that it would be anywhere between 50% and 300% more expensive to use its tiles rather than asphalt to pave a roadway. According to one estimate, the cost to cover all of America’s interstate highways would be $1 trillion. This doesn’t seem a cost-efficient way to harvest solar energy . Another problem is how to keep the tiles clean: roads tend to get rather dirty. And then there is the question of durability and maintenance: stuffed with electronics, they may not survive for long, especially in unforgiving climates. Yet the Brusaws are not going to give up easily. They have been promoting their idea for years. Before turning to Indiegogo, they already received several grants from America’s Federal Highway Administration, including one for $750,000 in 2011. And they recently got a chance to demonstrate the potential of their invention, albeit on a small scale, with the first-ever solar parking lot. Their home town may even soon install the technology on a public road. Join our Community and request for your FREE consultation session Now !